Hal Leonard Music, c1996, 55 pages, 1st EDITION . EXCELLENT Condition Picture Cover Over-sized Softcover. This book has only the slightest cover wear with slight bump to one corner, otherwise it basically looks LIKE NEW! Pages & Binding are NICE & TIGHT! BECK HANSEN (born Bek David Campbell, July 8, 1970) is an American musician, songwriter, and multi-instrumentalist. ODELAY is a 1996 album by indie rocker Beck. After the mainstream success of "Loser", ODELAY included several new hit singles, including "Where It's At", "Devil's Haircut" and "The New Pollution", which expanded his audience considerably. The album peaked at #16 on Billboard's Pop Albums chart and eventually sold over 2 million copies in the US. It was also Beck's first hit album in the UK, making #17. 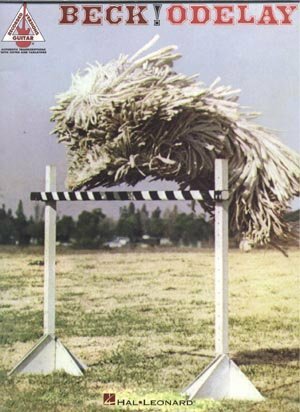 The album's unusual cover photo, which appears to show a mop jumping over a hurdle in life, is actually a real photo of a Komondor, a rare breed of dog with thick matted hair. Interestingly, ODELAY could have been drastically different in direction and style. In 1994, when Beck started to record tracks for his follow-up to MELLOW GOLD, he recorded a number of songs with Tom Rothrock and Rob Schnapf of Bong Load, but then decided to work with the Dust Brothers instead. Three songs from these Bong Load sessions have been released: one, "Ramshackle", on ODELAY, and two others: "Feather In Your Cap", which was released on its own as a single and on the soundtrack to the film, Suburbia, and "Brother", which was not available to the public until the release of "Jackass" in 1997. All three of these songs are acoustic, sparse, and melancholy, and have a haunting sound very different to the party vibes of the Dust Brothers' ODELAY. The name ODELAY was inadvertently invented by a sound engineer who was working on the album. He misheard the Mexican slang word "orale" in one of the songs as " ODELAY " and transcribed it as such. Beck liked the name, and used it. ODELAY won a Grammy Award for Best Alternative Music Album in 1997. It was voted as the best album of the year in The Village Voice Pazz & Jop (Jazz & Pop) critics poll. In 1998 Q magazine readers voted ODELAY the 51st greatest album of all time. It is number 305 on the list of Rolling Stone's 500 Greatest Albums of All Time. Voters in Channel 4's 2005 "100 Greatest Albums" poll placed it at number 73. Buyer pays $4.55 Shipping in Continental U.S. **Payment must be received within 10 days of the end of the auction, unless other arrangements are made. Checks held till clear. Money Orders & Paypal Payments shipped on receipt. Buyer Must Request Insurance at Additional Expense. IL residents Must add 7.25% sales tax.